Over the last week, I’ve quietly told a few friends about my plans. And over the last two months, I’ve been puttering away quite diligently, sometimes scatterbrained and sometimes strategic, to put it into action. Now, I’m going to mention it briefly to you: I’m opening an Etsy store. Three years ago, my boss and I were talking about different career paths. She brought up freelancing and I poo-pooed it. I’d contemplated owning my own business just long enough to decide I didn’t want anything to do with the B-word. I didn’t want to hustle. I didn’t want to be my own boss. I didn’t want to make big decisions. Three years later, I’m a business owner. Two years ago, one of my Girls’ Life coworkers started a new business with a friend. MAKE TRIBE is a luxe crafting events biz that has morphed into a beautiful indie brand. When I first heard about it, I was dubious. It is a perfect fit for my coworker, but I didn’t get it. Two years later, I get it. Three years ago, I was set in a direction for two reasons: First, I was good at most of what I was doing, and second, I had decided back in college that this was what I was going to do. Changing paths was not an option—it had not occurred to me as something a successful person could or would do. Two years ago, I was stuck in an “I could never do that” mentality. Well guess what? I’m going to do it. Over the last week, I’ve quietly told a few friends about my plans. And over the last two months, I’ve been puttering away quite diligently, sometimes scatterbrained and sometimes strategic, to put it into action. Now, I’m going to mention it briefly to you: I’m opening an Etsy store. I’m playing with line sheets and creating patterns and experimenting with what I like to me and what inspires me to keep making, regardless of the potential bottom line. In the store that exists in my head, you’ll find bright, beautiful personal and home goods that will make you smile when you see them. My goal right now is to make the kind of accessories I wanted to buy when I hit my first major adult milestones: first job, first apartment, first big move, first promotion, first serious romance, first friends-getting-married or friends-having-babies or friends-buying-a-house. You know, the sorts of things you rush on to the ‘net to buy when something big and awesome happens to you or your friends. Stuff you covet and keep and treasure and pull out when you’re having a bad day. When I started Ingenue Diaries late in 2013, I did it as a creative outlet. Then, I had been laid off, moving, desperately clutching at some semblance of a plan. Since then, I’ve gone through a couple different ones. Now, ID has become a part of me. 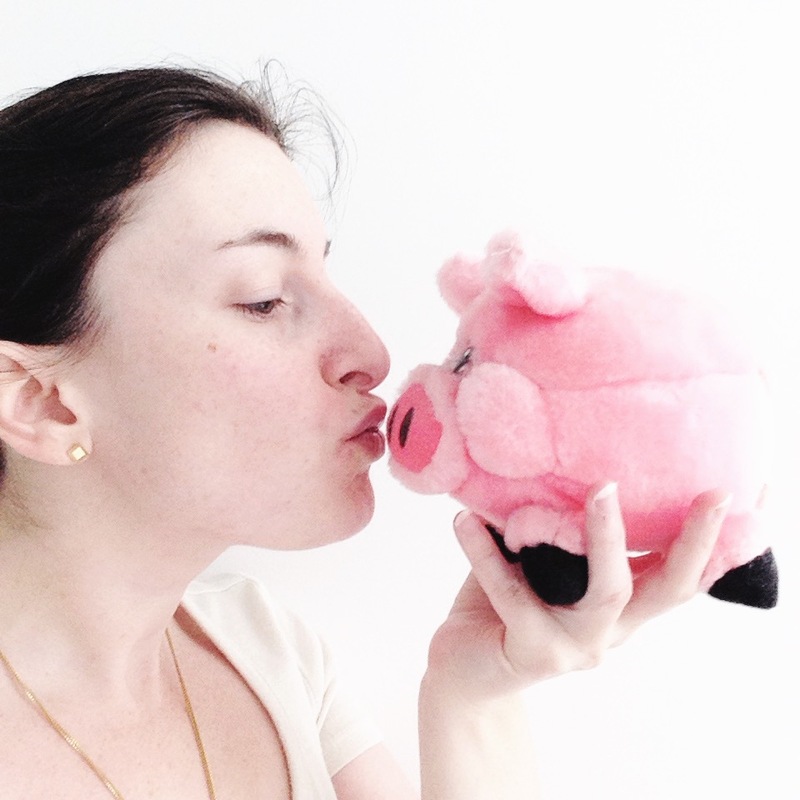 It’s not just a blog—it’s been and will continue to be the creative experience I’m living. I’ll be writing just as I am right now about what’s going on in my mind and my life, but the focus is going to narrow. Where we are now is more general. Where we’re going will center on the creative process (both writing and making), on building a business, on nurturing a brand, and on living a life that’s not what I expected it would be two, three, or five years ago. Cheers to doing and living and making, friends! Thanks for sticking with me! Somewhere between our picnic spot and the parking lot, clutching my bag and chair, I stopped and laughed. This, I thought, was not was I’d expected my Fourth of July to be. Squelching through puddles in Vans and dripping jorts—nope, not on the to-do list. Laura and I sat in our lawn chairs as the thousand or so people around us tore down their tents, poured out their drinks, and packed up their koozies. It wasn’t going to rain, we laughed. Twenty minutes later, I was holding a lawn chair to my chest, trying to shield my white t-shirt from the pelting rain. We were wrong (and my defense proved useless, in case you were curious). The dove gray cloud that we’d spied past the trees rolled in fast and its charcoal gradations brought along lightning and downpours. Somewhere between our picnic spot and the parking lot, clutching my bag and chair, I stopped and laughed. This, I thought, was not was I’d expected my Fourth of July to be. Squelching through puddles in Vans and dripping jorts—nope, not on the to-do list. And yet, it was the most memorable Independence Day I’ve had in years. Before the deluge, another friend and I had been talking about expectations. She is in her mid-30s and is struggling with all the things you’d expect a woman in her 30s to be struggling with—love, the question of children, the idea of success. And she told me that when she looks at her family, she sees the norm: cousins who are CEOs and young families who are already settled. She feels like a black sheep, she said, and always has because those are not the characteristics of her idea of a happy present and successful future. I think we tend to feel guilty when we diverge from a path that’s considered the norm, one that maybe our family or our friends have modeled for us and expect us to follow as the default. I think that guilt might be part of us feeling as though by choosing a different life experience, we’re saying that we don’t value or approve of what those closest to us have chosen. I wish we could cast that guilt aside, and along with it, the need to defend our choices to those who picked differently. What’s funny, to me, is that both sides feel both guilty and defensive when they look at the other. Am I happy with my path? What would my life be like if I had majored in this or taken that job or didn’t get married? I know I’m particularly introspective, but I don’t think I’m alone in wondering these things. And I don’t think that it’s bad to wonder these things. What hurts us is when we move from wondering to pressuring ourselves to be something we’re not, or to live a life that we’re not interested in living. It’s something I’ve been thinking about a lot over the past few months. I find that when I meet new people or catch up with old friends or family members who aren’t familiar with my work or my lifestyle, I downplay my passions and I minimize what I do. I characterized one of my recent features as “stupid” to a third cousin at a funeral, and during the conversation, a part of my brain was screaming at me, “What are you doing? !” Because my work isn’t stupid, and I know that. I enjoy my work, and I recognize that. And I’m very excited about my next steps—I live that excitement every day. So why do I represent it as something entirely different to the uninitiated? I don’t have answers to that question just yet, but I’m working on it. I’ll keep you updated, yeah? In the meantime, sound off on your own black sheep-ness in the comments. What keeps you fierce and different and guilty and defensive? Tell me, do! Since I started quilting, many people I know have heard about my new hobby, marveled at what I’ve made, and then promptly shaken their heads and said, “I could never do that.” I always respond with, “Sure you could!” but I never think for a second that my comeback holds any sway. They’ve already made up their minds about what their futures hold, and it’s certainly not quilting. And that’s fine. I don’t have any dreams of being a welder or a carpenter or a weaver, so I don’t expect everyone to be drawn to quilting just because I’m passionate about it. But when I hear people dismiss the possibility of even being capable of executing a quilt, I feel like they’re killing their futures without giving them a chance. Let’s be honest: For many people who make things (or decide not to), it’s not a life-altering decision. They do it because it seems fun or they have time to kill or they need to make X for Y. But for many, many others—certainly all of those whose blogs I follow and whose Instagram accounts I stalk and whose Podcasts lull me from creative place to creative place—it is life changing. It could be monetary or motivational or aspirational or another creative outlet. For me, it’s changed the way I live my life. I’ve made changes to how I schedule my day; now, I get up earlier (because I like to sew in natural light)—a big change for me, a natural night owl. I’ve learned how to balance my passions so that I can both grow the new one (making) and foster the old one (writing). And on an even more personal level, it’s taught me how to challenge myself continually and to forgive myself for perceived failures or flaws. 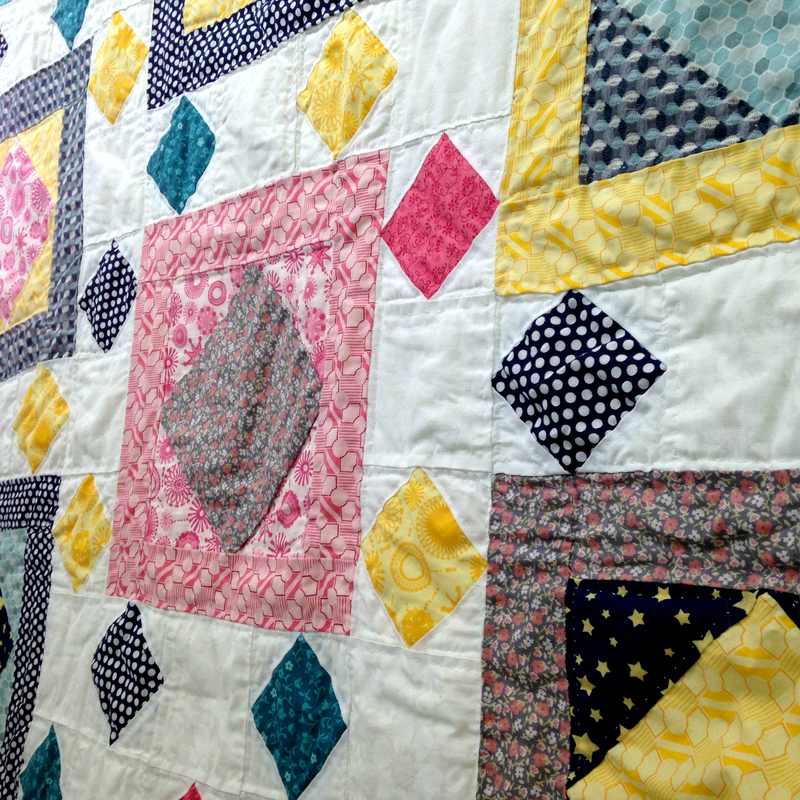 For what I know quilting has given me, I long for others to know what it—or similar crafts or challenges that feel huge and unwieldy—could do for them. When they immediately lock those doors in their brains, they slam shut the possibilities of more. And that, to me, is a shame. As I continue to craft and grow as a part of the making and quilting communities, I have a feeling that response is going to grow louder. I’m looking for a better way to counter it—if you have any ideas, drop me a comment! I’m really good at not doing what I should be doing. It’s a trait I’ve been developing over the years. Sometimes, I get it: I hate calling strangers, so I still haven’t called my bank about an issue that sprang up last spring. But sometimes, it’s silly. When I started quilting, I decided that I didn’t want to knock out a simple quilt that was row after row of basic square patchwork; I wanted to keep learning new techniques. I was strategic about it: I designed my own quilt. I cut out the wrong-sized triangles twice. I sewed everything by hand, pulling out stitches when necessary to rework odd areas. And I learned a lot. 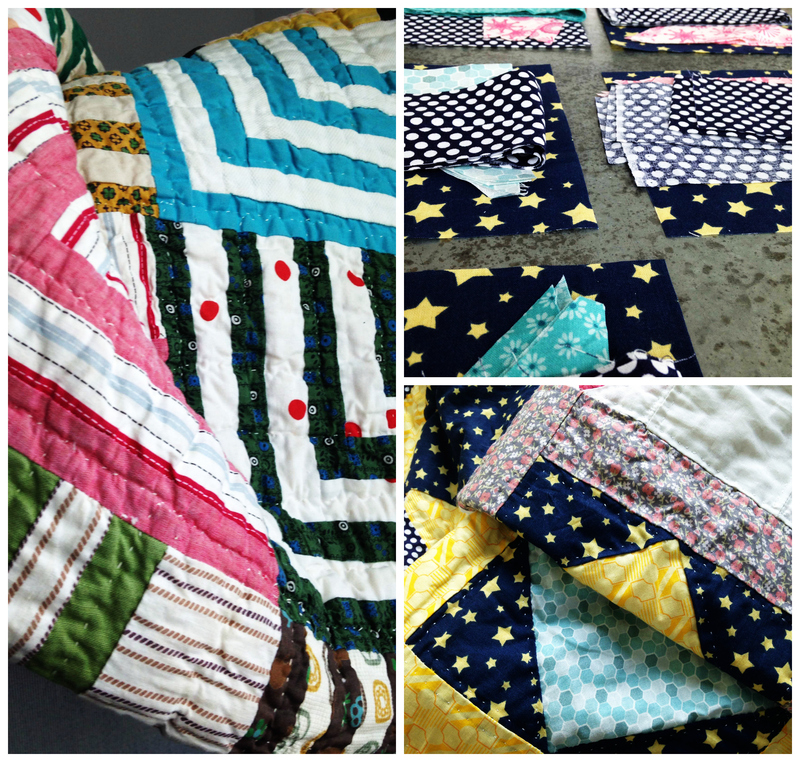 The entire quilt, which is shy of being a twin-size, is pieced, backed, and quilted. The only thing left is to bind it…and I’ve been putting it off for weeks. Binding doesn’t seem hard. 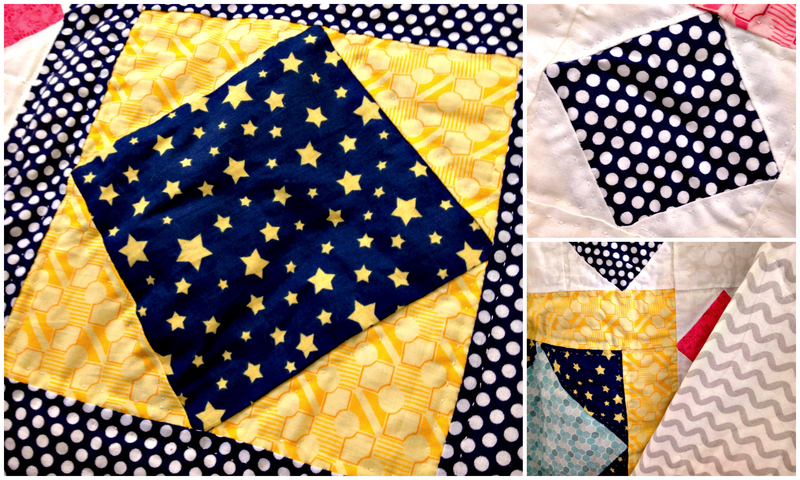 In fact, a lot of quilting bloggers I’ve read seem to actually enjoy it. And yet, I just don’t want to. So, I ask myself, why? Psychotherapists tell us that we procrastinate for one reason: We fear that doing whatever it is that we’re avoiding will cause us some amount of pain. I’m pretty sure my quilt isn’t going to strangle me as I bind it, and my fingers are already numb from the number of times I’ve stabbed myself while quilting. Physical pain is out. But emotional pain is something different. I have a feeling that I’m afraid of the project ending. I’ve really enjoyed myself working on this quilt, and it’s been completed entirely by hand. That last bit is something special, something I’m particularly proud of. I’ve gone through nearly two spools of thread, and I’ve done it purely with my fingers. Now that I have a sewing machine—a shiny Husqvarna that I really do like—I fear that the enjoyment I get from sewing by hand is going to be lost. With a machine on standby, sewing by hand is inefficient. So, I could tell myself the next time I look at a hand needle, why bother with that old thing at all? It’s the same argument you can make for typing on a computer, as I’m doing right now, instead of writing with a pen on paper. I am a fast, accurate typer and a slow, messy writer, so putting my thoughts down digitally is, on the surface, a far more productive way to spend my writing time. Sometimes, though, the words don’t flow when I’m staring at any empty Word document. Sometimes, I need a fine-point RSVP pen in my hand to get my brain waves moving. Often, I switch fairly seamlessly between the two, preferring to brainstorm by hand and my speedy writing on my laptop. The same will, I think, be true of my hand sewing in the future. The machine is a wonder—the way it whizzes through seams that would take me hours by hand! But I don’t like listening to the whir. I don’t like pressing the pedal. And I don’t enjoy digging through stitch settings or troubleshooting bobbin hang-ups or fiddling with tension. I adore the silence and focus it takes to sew by hand. My hope for the future is that I remember that I have a choice; just because the machine is there doesn’t mean that I have to use it. And if I choose not to—or choose to use it, for that matter—the only person attaching guilt or fear or negativity to the situation is me. Do you procrastinate on activities you actually enjoy, just like I do? Tell me why you think you did it in the comments! I like to argue. It makes me nervous as hell. I start shaking while debating something silly, sweating when the topic turns more serious. I don’t know why I do it, but I know it comes naturally. Thus, it’s second nature for me to see an argument, like black people in Baltimore are rioting because nobody else listens and finds solutions when they speak out peacefully, and think, well, rioting isn’t the right answer here. I—I’ve been making a lot of “I’ statements lately, which bothers me—think I’m a pacifist. I don’t like seeing people hurt. I don’t agree with war. I don’t think looting solves any problems. I don’t think destruction of anything is positive. I prefer diplomacy. But I’m starting to see that it’s not enough to look at what someone or some group of people is doing and to disagree with it and thus their entire cause. I don’t want to say anymore that I think rioting is wrong and that you really need to stop doing it. Where is the solution in that? There is no constructive criticism, nothing that assists the situation. I don’t want to add more negativity or division. So what now? I just read and re-read Michael Eric Dyson’s op-ed in The New York Times. He writes about Freddie Gray’s funeral, and does a good job, I think, of illustrating the type of problems black people in Baltimore and other poor urban centers are facing. I say problems because, as he and Revered Jesse Jackson say, in this piece and during Gray’s service, respectively, it’s not just police brutality that’s a problem. It’s not just one thing. It’s a slew of social issues, and, it seems to me, we’re so caught up in saying, “Well, that’s a bad way to solve X problem,” that we’re not doing anything productive to actually solve the problem. In his funeral remarks, Rev. Jackson mentions that his people feel threatened. I don’t want anyone to feel threatened, I think, how can I help? He mentions that his people are afraid. I don’t want anyone to be afraid, and even though the violence if your riots make me afraid, I want us to overcome this fear. How can I help? That’s what I’m feeling and thinking now. And for once, I feel like my responses are turning toward productivity. I’m going to keep thinking on that and asking those questions. I have a feeling that as much as people (ahem, like Donald Trump and random commenters on random websites) urge leaders to diplomatically fix things, somehow, that that’s not going to work. I think we—all of us—need to come together and realize that we don’t want this group—any group—to feel this way or to be treated this way, and that we all—not just this group, any group—need to realize that it’s a problem for all of us, and that we need to stand together to find workable solutions that will heal our society. And really, I think Rev. Jackson, and everyone else in his community, must be exhausted. Updated April 30 to correct the spelling of Freddie Gray’s last name. I default to the British “Grey” every single time. Apologies! The farther I am from my teen years, the more I appreciate what Teen Vogue does. I’m thrilled to be writing for the (gorgeous) teen fashion magazine’s website, covering lifestyle topics like this one. Find the original here on teenvogue.com.